EyeforTravel Amsterdam have an attendee list for the digital and data travel elite that you need to see! EyeforTravel have just released their attendee list for the EyeforTravel Data and Digital Summit in Amsterdam 2017 (November 29-30). Don’t miss your chance to join Europe’s largest digital and data travel conference. The focus of this event is mobile, social media, data analytics, personalisation and tech innovation. With more travelers turning to the internet and mobile to get ideas, inspiration, and options for their trips. Mobile has made the journey more spontaneous with ‘on the go’ research tools. Research shows that 85% of leisure travelers decide on activities only after having arrived at their destination. Making it crucial for travel brands to be able to connect and create bespoke offerings to their customers via social media platforms like Facebook and Instagram and more direct communications using customer profiles. EyeforTravel are excited about this shift and have positioned their EyeForTravel Amsterdam (November 29-30) to focus on the digital and data big bang in travel. These event’s will bring together 250+ the best brands in travel to focus on how to develop data analytics, artificial intelligence, product development, revenue analytics, to drive loyalty and more personalized experiences. They are even offering a sneak peak of their attendee list 2 months before the event. Luxury travel consumers are far more comfortable using their smartphones to book their flights and accommodation than ordinary travellers according to EyeforTravel’s The Global Luxury Travel Consumer report. Luxury travellers are leading edge consumers when it comes to technology, making them more than twice as likely to book their accommodation through a smartphone finds EyeforTravel’s new report. The research, which took in more than 2,000 luxury consumers across three countries, uncovered that whilst desktops and laptops still remain the main booking route, with 46% of luxury consumers using these devices, 31.1% of luxury consumers booked their accommodation using a smartphone, versus 13.9% of ordinary travellers. 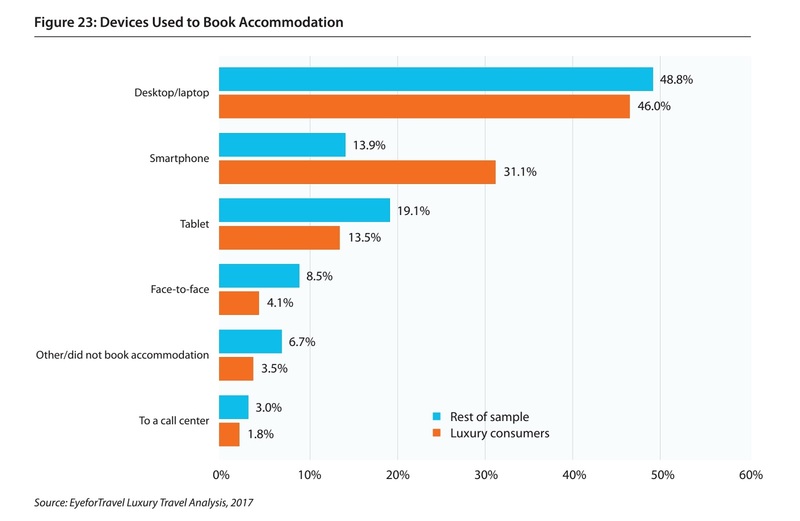 A similar, but slightly less pronounced, pattern occurred in flight bookings, with 30.2% of luxury bookings heading through smartphones against 18.2% of the rest of the sample. The trend marks out a difference in cross device behaviour between the two groups, as during the research phase both luxury and ordinary travellers use their smartphones as their primary research device at nearly the same rate – 35.8% to 32%. These findings suggest that luxury consumers are happier to continue their entire travel journey using a single device rather than switching across multiple devices as the journey progresses. The report also finds that ordinary travellers are substantially more likely to use non-digital booking routes and also to use their own means of transport and stay with friends or relatives. 13.1% of the non-luxury respondents in the survey report booking their flights through a face-to-face travel agency, against 5.4% of luxury consumers. This detailed report looks at the state of the overall market currently and breaks down individual country markets, luxury consumer behaviors and spending patterns, and gives you the major trends to look out for. Country analysis of the major luxury travel markets in Europe, North America, Asia-Pacific, and the Middle East, covering both developed and emerging economies. Unique proprietary data based on more than 2,000 luxury travel consumers. Behavioral analysis of luxury travellers, including lead times, device usage, booking patterns, and spending habits. Major trends and developments in the luxury travel market. Data taken and analysed from nearly 100 different sources. Over the course of a year, luxury consumers spend over six times as much on travel than the average consumer and the trend is for the disparity to get even bigger finds EyeforTravel’s The Global Luxury Travel Consumer report. Whilst the average traveller spends $1,690 per trip, luxury consumers on average lavish $5,365 per trip according to the report. 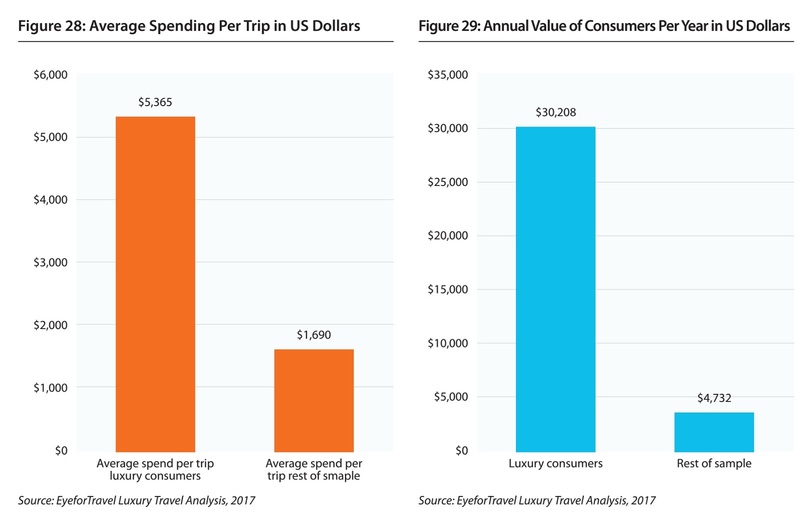 The different levels of spending become even bigger over the course of a year as luxury consumers take double the trips per year at just over 5.6, meaning a per annum outlay of over $30,000, or six times the average traveller’s spend. This gap is more likely to widen than diminish says the research, as wealth continues to accrue at the upper end of the income spectrum and luxury consumers prioritise experiential spending and put less emphasis on personal goods. The number of High Net Worth Individuals (HNWIs) globally is expected to comfortably grow by double digits each year well into the 2020s, adding millions of luxury consumers into the market. The report found that luxury consumers in the report’s survey were also planning to take twice as many vacations on average, illustrating the continuation of current trends. A huge 16% of luxury travellers report planning 10 or more trips per year, compared to just 2.5% of the other consumers in the survey. A further quarter of the luxury travel sample plan to take between five and nine trips in the 12 months after the survey was taken, far above the 6.3% reported by lower income consumers. These consumers are switching more of their discretionary spending into leisure travel, with developed economies leading this trend but transition occurring rapidly in emerging economies as wealth becomes more widespread. The change will affect luxury consumer behaviours as they book and once they travel. For example, the report notes that Chinese luxury consumers are shifting their spending away from shopping and towards activities and accommodation, with adventure and exploration increasing in importance as shopping falls. Whilst high-end tours and activities should be one of the primary sectors to benefit given the importance they have to the travel experience, the changing emphasis of luxury traveller priorities means that hotels will need to think hard about how to appeal to these consumers. Luxury travellers ae now more focused on finding unique accommodation and so hotels will need to think about character and local interactions that can really add something to these consumers’ trips while still continuing to provide a high level of service. On October 19-20, over 350 senior travel executives from some of the biggest brands in travel will be meeting at the Mandalay Bay in Las Vegas at EyeforTravel North America 2017. EyeforTravel has released a limited number of passes exclusively for members of the press. With attendees from brands such as Priceline, Lola, IHG, Marriott, Hilton, Expedia, Booking.com, Club Med, Carlson Wagonlit Travel, Trivago and many more – this is the perfect opportunity to find out from the decision makers themselves where the industry is headed and what the upcoming trends are before anybody else. The event will be taking place at the Mandalay Bay over 2 days and will cover travel distribution, marketing, data, RM & Pricing as well as technology. On both days, the event will start with keynote presentations until the lunch break, after which the event will split into 2 tracks and attendees will be able to choose the sessions they would most benefit from. · Prepare for the Next Wave of Disruption: What Will the Industry and Your Business Look Like In 10 Years’ Time? · How is the Macroeconomic Landscape Impacting the Travel Industry? · Poised for Digital Transformation: How Will AI Revolutionize Travel? · Virtual and Augmented Reality: Hype or Hit? Today personalized travel is the internet, machine learning and mobile devices! Data is the new oil of the information age. Organizations that can harness the power of data can enhance their customer experience, achieve a competitive advantage, improve conversion rates, segment more effectively, drive loyalty and develop unbeatable products. EyeforTravel are excited about this change and have positioned two EyeforTravel events to focus on just this. Our two summits – Smart Travel Data Europe (Amsterdam Nov 29-30) and Smart Travel Analytics North America (February 27-28, Miami) will allow you to turn new data legislations and technology into an advantage and convert your data into pure profit. These event’s will bring together the best brands in travel to focus on how to develop data analytics, artificial intelligence, product development, revenue analytics, to drive loyalty and more personalized experiences for travellers. Take the chance to network with travel data decision makers from Accor, Airbnb, KAYAK, Hilton Hotels, Delta Airlines, Amazon, Lastminute.com Vueling Airlines, Marriot, Southwest Airlines, Wyndham Destination Networks, and more, join the events today. Pick the event that works for you! 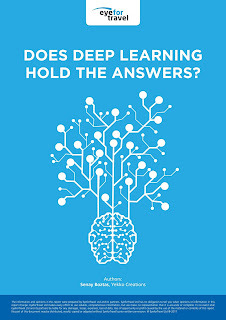 Neural networks are becoming more complex and powerful, creating a revolution in data analysis and making them indispensable to the travel and tourism industry according to EyeforTravel’s Does Deep Learning Hold the Answer? report. Although Artificial intelligences (AI) are a long way from truly emulating the human brain and replacing your data analysts, they are taking their first steps and should definitely be a part of your data team. This is the conclusion of EyeforTravel’s new report into deep learning, which is free to download now. The case for using neural network-powered deep learning techniques lies in the potential return on investment that they can provide. Not only can neural networks undertake complex analysis but they can also reduce workloads, freeing up data professionals to work on more demanding tasks. For example, the report notes that Stena Line’s deep learning program to understand price competition for its onboard products saves weeks of analyst labour, increases accuracy dramatically and all for a cost of roughly EUR15,000. It's not just data teams that deep learning can help, marketing teams also stand to benefit substantially from deep learning. Neural nets can learn huge amounts about what makes customers tick, such as optimal pricing points and the best creative as well as where to deploy this. The report notes that The Travel Corporation is using deep learning to track online sentiment and automatically adjust advertising to appropriate formats and destinations. The report is part two of EyeforTravel’s How Will Artificial Intelligence Transform Travel? report series. You can find the first report, which studies chatbots in travel, by clicking here. 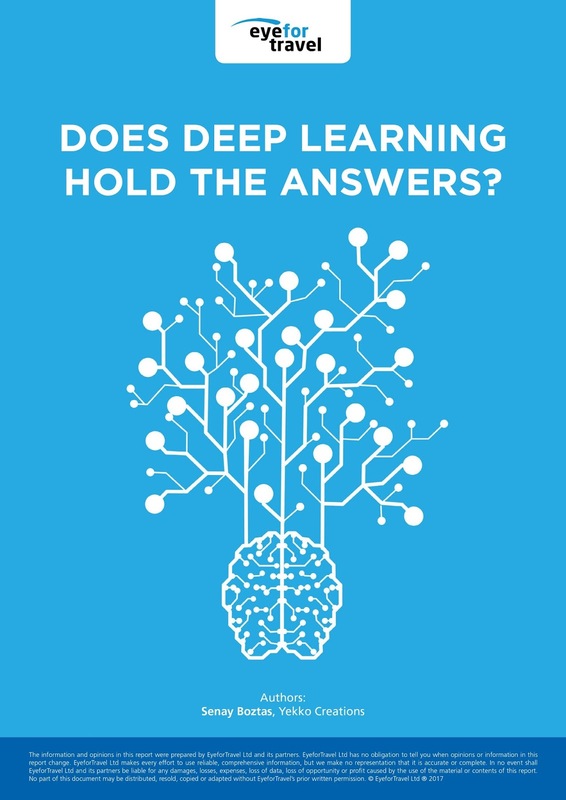 Artificial intelligences running deep learning programs are already helping travel brands understand pricing, improve the customer experience, reduce workloads and make marketing smarter according to EyeforTravel’s new Does Deep Learning Hold the Answer? report. Can deep learning change travel and tourism? As data becomes the difference between a growing brand and one in decline, EyeforTravel’s new Does Deep Learning Hold the Answers? report finds that deep learning can and is changing the travel landscape. Travel could be one of the main beneficiaries of rapid advances in Artificial Intelligence (AI) learning techniques as struggles to utilise huge amounts of data in order to understand complex human behaviours. Key to this is deep learning according to the report, which is free to download now. This a method where neural networks organised in hierarchical layers evaluate data sets. Deep learning deliberately aims to emulate the way that human and animal brains interpret information and consequently is making huge strides. Currently, the technology still is at an early stage and the neural nets that power deep learning are far simpler than biological counterparts, usually using layers of nodes that passes a decision onto the next layer of nodes once a value has been reached. Therefore, what it truly excels at is focusing on a single task, which is typically finding relationships and patterns in very large quantities of data. “What we are doing now is artificial narrow intelligence, AI that’s specific to a certain task,” says Amer Mohammed, Head of Digital Innovation at Stena Line. “We need to come up with mathematical models that can actually understand the world, not just fake understand it.” In the meantime some of these tasks that deep learning is already being used for in travel include pricing, language processing, image recognition, consumer analysis, and market modelling. In the future, AIs will be able to tackle multiple tasks and come closer to human abilities as rapid advancements are being constantly made at the bleeding-edge of machine learning. Already Google’s DeepMind division has been able to build a multi-tasking AI and the rate of advance is staggering. 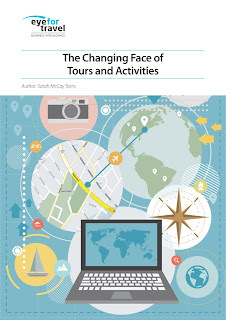 Start-ups are jumping into the tours and activities scene and creating innovative new ways to connect consumers with inventory finds EyeforTravel’s new the Changing Face of Tours and Activities report. A variety of start-ups have moved in to the tours and activities to capitalize on the fastest growing sector in travel, opening up new experiences for consumers and ways for them to purchase their vacation’s activities. 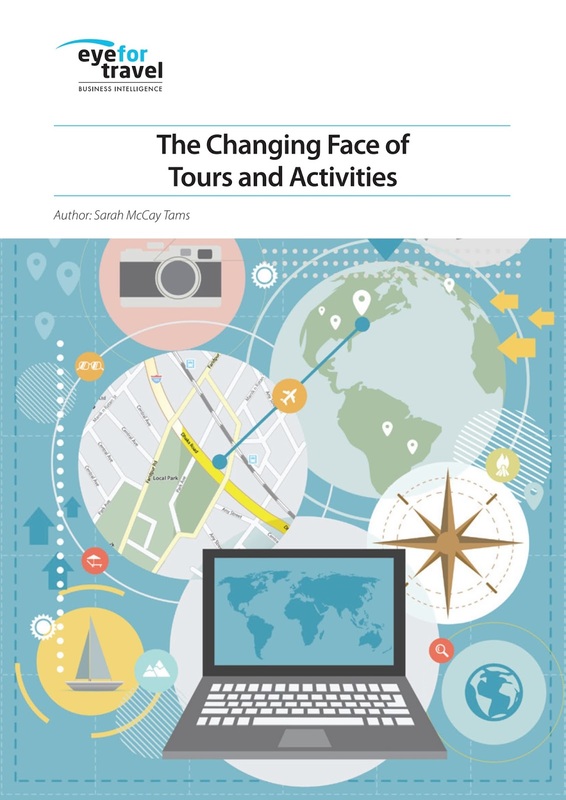 EyeforTravel’s the Changing Face of Tours and Activities report, which is free to download now, has identified start-ups as key to understanding the development of the tours and activities market as they are innovating across the entire supply chain and broadening access to the sector. Core to all of their businesses is the development of cheaper technology. Application Programming Interfaces (APIs) and cloud computing are allowing suppliers and vendors to sync up and distribute inventory, and start-ups are aiming to make this as easy as possible. Tours and activities suppliers can now independently upload their inventory to a variety of start-up services, such as Bokun or GetYourGuide, or they can work with other that provide them with templates to allow them sell online, such as TrekkSoft. These start-ups are then marketing tours and activities suppliers’ services across their own and thousands of third-party partners and interfacing directly with the suppliers’ reservation systems to make the process as smooth as possible. The upshot of this is it is allowing the sector to be brought into the digital age and giving consumers access to tours and activities that just five years ago would have been impossible. Consumers can now both book far in advance online from centralised databases of inventory and also use their smartphones to make reservations as they travel. They are also far better armed with information, for example Arrivedo aims to create neighborhood guides and use these to link together tours and activities, hotels and consumers. Erik Tengen, Co-founder, Oaky App believes one day we could see a single platform capable of handling all activity bookings. “Traditionally offline-oriented people are making the shift towards online. And because of the growth in API possibilities, we're likely to soon get a market where people book all their activities on one platform,” he says. This is not only to the benefit of the consumer, who has more choice, more personalized packages, and ways to plan and pay, but also travel brands across all verticals. “Think about the following: without technology, a personalized tour desk could only be available in the biggest hotels. Now, with technology, virtual and personalized desks could be in the smartphone of any user when reaching any hotel lobby, despite the size of the hotel,” says Alonso Franco, CEO and Co-founder of Arrivedo. Whereas previously, huge resources would be needed to put in place a distribution system for this most diverse sector of the travel industry, now even the smallest players can jump in to tours and activities. Not only have start-ups helped to digitalize inventory, but they are also now the power behind the throne to several of the internet’s largest online travel companies. For example, Bokun teamed up with Expedia Local Expert at the end of 2016 with the aim of streamlining the booking process for tours and activities. GetYourGuide has integrated with Booking.com and lists its tours inventory via KAYAK’s dedicated tours and activities product and has recently partnered with EasyJet to offer tours and activities direct to the airline’s customers. TourRadar has been working with Amadeus since 2015 and TrekkSoft works with Viator. Tours and activities start-ups are therefore becoming a key piece of the travel industry and everyone should keep an eye on who becomes the next big thing.